Miami Republicans want to talk taxes and economy. Do they want Trump as a spokesman? How much do Miamians love them some Trump? Riffing and rollicking, a playful Donald Trump came to South Florida Monday morning and embraced the most Hispanic city in the state, talking up the economy, tax cuts and the country’s efforts to punish repressive regimes in Cuba and Venezuela. But how much do Miamians love them some Trump? The crowd that greeted the president reciprocated and then some, showering Trump with praise and erupting when he likened the blue-collar community’s work ethic to the values that founded the country. They roared when he slammed the Nicolas Maduro regime in Venezuela and mentioned how “tough” his administration is on Cuba — which he pronounced “Q-Bah.” They laughed at his one-liners. Trump’s visit to South Florida, coming seven months ahead of the mid-term elections, prompted speculation about who from his party would show up with him, given his low polling numbers and volatility. Gov. Rick Scott, a surrogate for Trump during his presidential campaign, was in Naples and then headed out of state Monday attending previously scheduled events, according to a spokesman for his U.S. Senate campaign against Democratic Sen. Bill Nelson — whom Trump knocked during his appearance, billed as a townhall. Republican Rep. Carlos Curbelo, likely headed for a difficult reelection campaign in a district that chose Clinton by 16 points over Trump two years ago, said through a spokeswoman that his travels back to South Florida from a summit in Peru kept him from the event, though Sen. Marco Rubio — who isn’t up for reelection — made it back in time. Miami-Dade Mayor Carlos Gimenez, a moderate Republican who has controversially embraced some of Trump’s more controversial policy proposals, missed him on the tarmac at Miami International Airport. 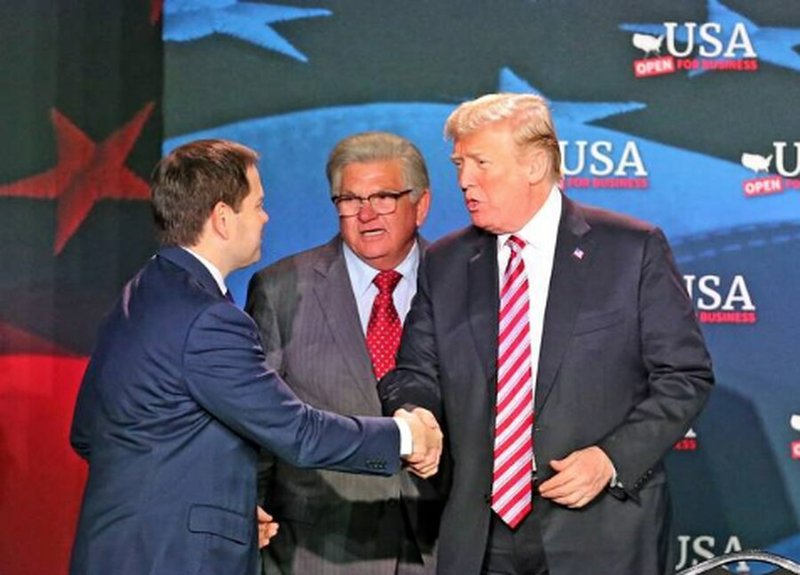 Still, Jose Mallea, a co-owner of a Doral brewery and former political consultant for Marco Rubio’s 2010 U.S. Senate campaign, said talk of Trump’s toxicity is overblown. Mallea, who participated as a panel member, said strong candidates and incumbents don’t need to worry about the president’s poll numbers. Republican Rep. Mario Diaz-Balart, who has yet to draw a serious Democratic challenger, said Trump brought his “bully pulpit” to South Florida to help spread a crucial message about the growing economy. And he said Hialeah was the right place to do it. Trump, who brought National Security Advisor John Bolton and Secretary of Labor Alex Acosta, stayed on message Monday, knocking NAFTA as “the worst deal ever made in the history of trade,” and pledging to try to crack down on a trade deficit with the Chinese government. He touted the unemployment rate, promised to grow the economy — and made sure everyone in the audience knew who was on team Trump when it came time to cut taxes.